Nokia Philippines posted on the availability and price of their latest smartphones Lumia 925. The handset retails at 23,500 pesos and now available at Nokia Stores. To those who are planning to get this via postpaid plan, it is exclusively offered to all Smart subscribers for free under Unli Data Plan 1500 with unlimited LTE. 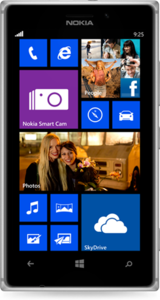 This run on Windows Phone 8 OS that comes with fresh and impressive design. The 4.5 inch screen and its sleek designs give a perfect look of the device, added to that is the AMOLED screen in HD resolution. The camera features 8.7 megapixels Pureview with Carl Zeiss lens for your mobile photography needs and 1.2 megapixels for selfie front shots.